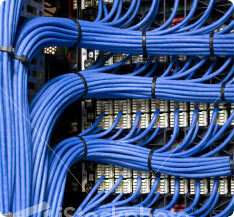 Voice and data cabling is available as well as moves, changes and additions to your voice and data systems. Your communications network is a vital asset. Whether you're handling a customer service call or transferring data, you rely on your communications system's connectivity to keep you in business. When you turn to Velocity Unified Communications for your most basic cabling, you establish a rock-solid foundation for day-to-day reliability and future expandability. Velocity Unified Communications structured wiring services combine voice, data, and video transmission capabilities into a single high-speed, highly flexible communication network. Velocity Unified Communications goes well beyond wiring to offer total communication solutions. We easily accommodate change, and are always there to support your evolving needs. Choosing Velocity Unified Communications to design and install your network wiring gives you the convenience of working with a single, reliable vendor for end-to-end communication services. Flexibility — Economically reconfigure or expand your network. To move or add a workstation, just plug it in. Expandability — Extend your network's usable lifespan at minimal cost. Combine voice, data, and video connections in any office, for use today or in the future. Velocity Unified Communications structured wiring solution can include combinations of fiber-optic, twisted pair, or coax cable to satisfy your immediate and future growth needs. Reliability — Engineered to meet industry standards, all wiring solutions are designed to maintain high quality transmission. Manageability — EAccommodate advanced diagnostic capabilities and management tools.